I just received an interesting advertisement from Mimi’s Café. Mimi’s is a 115-store chain of upscale casual dining establishments known for generous portions of predictably high quality entrees. 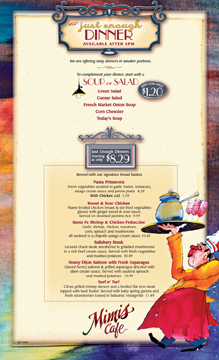 In an unusual twist, Mimi’s is promoting a “Just Enough Menu” focused on smaller portions at prices that range from $7-9 for lunch and $8-12 for dinner. While most advertisements you see promote “more for less,” this advertisement promotes “less for less.” Although this may be surprising, I believe it’s an astute move. Not only does it provide a low price incentive but the “less for less” approach strikes a chord with a recessionary mindset that has been taking hold. The National Bureau of Economic Research (NBER) announced yesterday that the United States has officially been in a recession since December 2007. I don’t think many people were surprised. “I think that we’ve got a ways to go, that this is going to be probably a deep and long recession,” said Jeffrey Frankel, a Harvard University economist who sits on the NBER. Customers are NOT NOT spending! They are just changing how and why they spend. Customers are continuing to opt for and engage in experiences that are designed to meet their needs. It’s just that their needs and priorities are changing significantly. Organizations that understand and quickly adapt to these changes can not only preserve but enhance revenue in the short term. Organizations that hang onto outdated beliefs regarding their customers’ priorities will not only lose revenue but will ultimately be seen as out of touch and irrelevant. The recession may just provide a cure for a wicked case of Affluenza! In light of the current conditions, our past consumer behavior looks a little embarrassing; like our evolutionary predisposition to acquire has been running amuck. The Times of London columnist, India Knight wrote, “I am happy to observe that the decades of vulgar excess are finally over… There is a strong collective sense of us all coming back down to earth. It’s like a huge national reality check and, unwelcome as it may be, there is a possibility that it will result in us straightening out our priorities.” (See: Dear Prudence: Recession May Bring Return of Traditional Values). We’re seeing early indications that there may be an aggressive backlash against indulgent and conspicuous consumption. Think about it. How many families need a 5,000+ square foot house other than to store all the stuff they buy to fill it to the rafters? Is it really necessary to spend between $40… and even $400… for a case of 12 liter bottles of water? Have I got a deal for you? 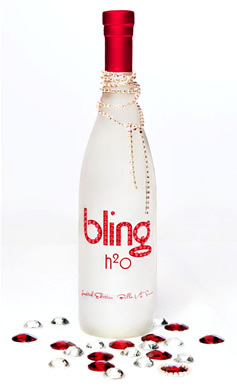 A case of Bling H20 (water corked in frosted glass bottles adorned with Swarovski crystals) is currently on special for less than $400/case. Even at this discounted price, it still makes the Evian “Palace” water seem cheap at $15-$20 a bottle. Similarly, is it necessary to spend three times as much on Renova’s designer toilet paper, $200 jeans, or a $690 on a Porsche baby stroller? As I mentioned in a previous post (When the Going Gets Tough… The Tough Get Closer to Their Customers), as customers that are struggling will buy up in order to keep up appearances, the ones that aren’t will tone it down. I expect we’ll see an echo of the “grunge” music, fashion, and lifestyle movement that arose out of the recession of the early ’90s. This will create opportunity for new products, entertainment, fashion, and retain outlets. As we head into the holiday season, we’re starting to see an increased tendency to give “practical” gifts rather than the more luxurious and exotic gifts. Look for high end companies to jump on opportunities to introduce more discreet chic alternatives. As the recession has taken hold, most customers are more willing to postpone purchases, trade down, or buy less. For many customers, yesterday’s “must haves” are becoming today’s “can do with outs. We’re also finding that business customers want to see products and services unbundled and priced separately. Customers want and need to evaluate the individual contribution of each component and are placing a premium on reliability, predictability, and performance. New products and services that address new customer priorities and put pressure on competitors can be effective but advertising and sales efforts must stress differentiated value and superior price performance. During more optimistic economic times, customers often find I easier to justify making investments in major projects. For example, homeowners might invest in renovating their home with the expectation that it’ll have a positive impact on their home’s value. However, as home values are shrinking, homeowners are opting for smaller scale and more focused and necessary improvements driven by livability and value preservation rather than economic gain. For example, at Home Depot, sinks, faucets, and bath accessories are selling briskly as consumers switch from full makeovers to more focused refreshes. We’re also seeing anecdotal evidence of a similar pattern with business buyers. It seems like more companies are breaking consulting and business services projects into smaller pieces and looking for parts that they can do themselves. Agile companies will create offerings and experiences that provide customers both smaller scale and “do it yourself” alternatives… in addition to offering fully integrated options for those who may continue to prefer that. People experience an emotional loss of control during unpredictable times. As a result, we typically see people acting in idiosyncratic ways driven by a deep psychological need to regain control. For example, people often engage more in collecting hobbies when they feel out of control in their lives. Depending on their individual interests, they’ll collect figurines, CD, DVDS, coins… just about anything. Conway’s Vintage Treasures blog, stated, ” “Collecting is a passion and a distraction to a better place, a better quality of life then we can get from say for example, following stock prices everyday…” Our research points to a deeper reason that has to do with control. The more people feel their situation is out of control, the more they compensate by engaging in behavior that helps them regain their sense of control. Collecting is one of those things. What’s the benefit of collecting another figurine when you already have 200 of them? Well, it makes them feel like they’re on top of their collection and making progress in small steps towards improving it. Aside from these deeper control issues, we also see more obvious ways of regaining control. For example, programmable thermostats and insulation which help gain control over fuel bills are another top seller at home improvement stores. Another way that customers regain control is by taking advantage of packaged offerings that reduce the actual or perceived costs or level of uncertainty. These bundled offerings can provide the comfort of “no surprises at a set price.” For example, while travel agencies report that although overall demand for travel is down, there has been a shift to U.S. and even local destinations, with a rise in popularity of “all-inclusive” stays. (See: Americans Flee Looming Recession). The opportunity for a local bed-and-breakfast might be: they could offer a package that included dinner at a local restaurant; bicycle rental, horse carriage tour or the like; and tickets to a local attraction or museum. Those establishments could provide the goods and services at a discount to the B&B (as a “cost” of marketing for the increased business), and the B&B could offer the full package below the retail cost of the individual items while guaranteeing the usage of their rooms. A win-win situation for all of the businesses! As a result, telephone use and discretionary spending on home furnishings and home entertainment should continue to hold up well, as uncertainty leads us to stay at home but also stay connected with family and friends. Sales of big-ticket electronics, like $1,000 flat-panel televisions and $300 video game systems, are on the rise, according to retailers and research firms. Falling prices for such devices and a looming government deadline to convert to digital television have helped. So has the view, sensible or not, that the technology is a good investment. In parallel with reverting to the practical, customers will look for small understated indulgences. They seek diversionary yet affordable experiences that can make them temporarily forget their worries. This includes things like going to the movies. During the height of the great depression, when 25% of families had no income and unemployed labor reached 40%, movie receipts still increased by 22%. Big indulgences like higher-end restaurant chains, including Ruth’s Chris and Morton’s, will be off since they are either actually too expensive or appear to be extravagant. In addition, frequently small indulgences that have become habits, like Starbucks, will also take a hit since the total expenditures on those items tends to add up. There are also a range of interesting anti-recessionary small indulgences. Chocolates and alcohol generally sell well during a recession. Another interesting affordable luxury that generally performs well during a recession is lipstick. The “Lipstick Index” is the result of a time-series analysis that suggests that lipstick sales are inversely related to the strength of the economy. “While it might seem counterintuitive for stores to teach shoppers to cut their spending, several chains have concluded that providing such knowledge can spur loyalty and keep customers from trading down to cheaper competitors. Whole Foods has redesigned their customer experience around the “Whole Deal” theme targeted at customers who remain committed to natural and organic foods but are feeling a heightened attention to cost. This experience includes several creative elements that match customers’ shifting priorities : an expanded selection of lower-priced alternatives marketed under their “365″ store brand, “Money Saving Meal Plans” and “Budget Friendly Recipes” that provide advice for containing costs while maintaining a focus healthy natural and organic foods. They are even offering “Value Tours” through the store in order to help customers find the most cost-effective solutions. Another way customers are looking for understanding is pricing. Astute providers do not necessarily have to cut list prices but they may need to offer more temporary price promotions, reduce the thresholds for discounts, extend credit to long-standing customers and price smaller sizes more aggressively. Those companies will be in the best position to deliver winning experiences that resonate with their customers’ changing needs and priorities… and, maybe even, turn a downturn into an upturn. In many ways, we are the product of the behaviors that worked for a long line of our ancestors. When faced with a life threatening situation, say happening upon a saber tooth tiger, our ancestors were the ones that ran first and asked questions later. Their friends that naively felt driven to go take a closer look weren’t so lucky. Based on situation after situation like this, we are the descendants of the people that were driven to: form and cooperate with others in reciprocal relationships, intuitively understand other peoples motives in order to be able to anticipate what they’d do; learn more about the way the world works in order to develop effective predictions and plans; and acquire the resources they needed to survive and that enhanced their status within the social hierarchy. At the deepest level, our experiences today influenced by the same set of basic survival drives that were adaptive for our ancestors in the situations they faced. While evolution does not pull our experiential strings directly, it has determined the design of how our brains process and act on experiences. How we react to threats, strive to connect with others, seek to understand the ways of the world, and acquire resources are consistent with the mechanisms that contributed to the survival of those that came before us. In the book, Driven: How Human Nature Shapes Our Choices, Paul Laurence and Nitin Nohria, two Harvard University professors, conclude that we are hardwired with four basic drives that can be used to explain a wide range of individual and collective behavior. These four basic drives are to: ACQUIRE (obtain essential resources as well as, intangibles that improve our social status), BOND (develop relationships with individuals and groups that provide security and pleasure), LEARN (acquire experiences and beliefs that help us make the world more predictable), and DEFEND (protect against threats to ourselves, as well as, our resources, relationships, and beliefs). As different as we all appear to be on the surface, these four basic drives provide a common framework that apply across individuals and across cultures. The degree to which they are satisfied directly affects our emotions and, by extension, our behavior. As we will see, individual temperamental differences have an effect on the relative strength of these drives and how they’re expressed. ACQUIRE: The drive to obtain essential resources as well as, intangibles that improve our social status. We are motivated to acquire goods that increase our sense of well-being. We experience satisfaction when this drive is fulfilled and frustration when it is not. Our drive to ACQUIRE applies to essential resources like food, clothing, shelter, and money. It also applies to collecting objects, symbols, and experiences that signal or improve our status relative to others. Beyond our basic survival needs, the drive to ACQUIRE is relative rather than absolute; we tend to compare what we have to what others have. Observers of the human condition have consistently pointed out that people are happy when they feel better off than other people they know, unhappy when they feel worse off. In addition, the drive to ACQUIRE is often insatiable beyond any physical need. We often want more even when there is little or no incremental benefit from having more. BOND: The drive to develop relationships with individuals and groups that provide security and pleasure. There is obvious survival value to forming reciprocal relationships with others, as well as, to be part of a group that provides safety, support, and identity. Most people experience positive emotions when they are associated with others and negative emotions when they are isolated. The drive to BOND also leads to emergence of cooperation. In order to stay positively connected to the group, an individual must naturally keep track of their indebtedness to others and reciprocate in a way that maintains the relationship. It also becomes very adaptive to sacrifice on personal gain in order to contribute to the greater good of the group. One of the other implications of the drive to BOND is the emergence of both a dominance hierarchy and attention to social justice. (See: Cognitive Ergonomics: How Customers’ React to Violations of Justice). LEARN: The drive to acquire knowledge and beliefs that help us navigate successfully in the world. There is strong survival value in our ability to make sense of the world around us and produce theories that help us: explain what has happened, predict what will happen, and develop reasonable courses of action. We get frustrated when things seem senseless and we feel satisfied when we can understand about how and why things happen the way they do. While the drive to acquire is materially driven, the drive to LEARN can be considered intellectual foraging. DEFEND: The drive to protect against threats to ourselves, as well as, our resources, relationships, and beliefs. This drive is rooted in the most basic fight or flight response that is common to most animals. We all naturally defend ourselves, our possessions, our family and friends against physical harm. By extension, we also DEFEND our ideas, beliefs, and accomplishments against psychological harm that would undermine our understanding of the world, our self-esteem, or our social status. When we successfully fulfill our drive to DEFEND, it leads to feelings of confidence and security. When we are faced with situations that are unpredictable and seemingly out of our control, we react with feelings of fear and resentment. Laurence and Nohria observe that these drives are independent in that they can neither be ordered hierarchically nor substituted for each other. This is important since it provides flexibility in our behavioral responses to the situations we face. This is particularly important since, in many cases, these drives are competing. We often can’t satisfy each of the four drives in every situation leading to psychological and moral dilemmas. For example, the drive to LEARN is often in conflict with the drive to DEFEND and the drive to BOND (cooperate) is often at odds with the drive to ACQUIRE. While these four drives are present in every effectively functioning human being, you know from personal experience that not everyone expresses the drive to BOND or LEARN or ACQUIRE or DEFEND in the same ways. For example, people vary in the both the magnitude and the direction associated with their drive to LEARN. Recognizing differences in the strength and expression of each of these drives is a very important part of understanding how different people have experiences… and in knowing what can be done to enable people to have more engaging experiences. We describe these differences in terms of Experiential Temperament. The first layer of the Experience Personae Model thus starts with a description of the how individuals differ in the way they express the four drives. An individuals’ experience takes place in a biochemical environment in the brain that influences the experiences they will find compelling, engaging, and comfortable. Different people react to experiences differently based on variations in the neuromodulation processes that influence their activity level and emotional state. Note: A neuromodulation process involves neurotransmitters (the chemicals that communicate across synapses in the brain) that are not reabsorbed by the neuron or broken down. These neuromodulators end up influencing the chemical makeup of an individual’s cerebrospinal fluid (the chemical environment of the brain) and, as a result, influencing (or modulating) the overall activity level of the brain. An individual’s unique expression of the drives we discussed above has a lot to do with variations in neuromodulation from one individual to another. In essence, neuromodulators act like the volume and tone controls that influence magnitude and nature of our reactions to experiences. In our work, we consider four Experiential Temperaments that influence the fundamental ways people engage with different types of experiences: Novelty Seeking, Harm Avoidance, Social Orientation, and Persistence. This perspective builds on work originally done by Dr. C. Robert Cloninger, a psychiatrist at Washington University School of Medicine. Novelty Seeking is the level to which a person is comfortable with,drawn to, and exhilarated by new experiences. While everyone wants some excitement occasionally, people that express high levels of Novelty Seeking seem to live for new experiences and new ways of looking at things. High Novelty Seeking people tend to be curious, exploratory, easily bored, impulsive, quick tempered, extravagant, enthusiastic, and disorderly. On the other hand, low Novelty Seeking people tend to be more indifferent to unfamiliar experiences. They also tend to be more reflective, frugal, orderly, and regimented. Novelty Seeking describes an individuals’ expression of the common underlying drive to LEARN. Novelty Seeking behavior contributes to an individual’s practical and theoretical understanding of the way the world works. In the brain, Novelty Seeking behavior is motivated and regulated by dopamine. High Novelty Seeking people appear to have low base levels of dopamine and, as a result, experience an increased sensitivity to dopamine releases. This gives Novelty Seekers an enhanced euphoric rush from novel stimulation that is either physical or intellectual. Harm Avoidance is the level to which customers strive to escape from unfamiliar, uncertain, potentially dangerous, or unpleasant experiences. People that are high in Harm Avoidance tend to be cautious, apprehensive, and pessimistic in experiences that don’t worry others. They also tend to be insecure in social situations and often need reassurance and encouragement with new experiences. They tend to be critical of themselves if things don’t go smoothly. On the other hand, people that are low in Harm Avoidance are generally confident despite the unknown aspects of an experience, even those experiences that would worry other people. Overall, low Harm Avoidance individuals tend to be relaxed, courageous, carefree, and optimistic. Harm Avoidance is an important way that different individuals express the drive to DEFEND. While everyone has the drive to protect themselves, high Harm Avoidant individuals take this to an extreme by avoiding behavior that would lead to punishment, danger, or embarrassment. Harm Avoidance appears to be regulated by serotonin. Harm Avoidant individuals are more prone to the frequent release of serotonin when presented with uncertain or potentially threatening situations. This frequent release of serotonin leads to a decrease in serotonin sensitivity and a resulting increase in cortisol which is associated with the feeling of stress. Social Orientation is an expression of the underlying drive to BOND. High Social Orientation individuals have an amplified need to BOND and tend to be effective in forming and maintaining strong reciprocal relationships. Social Orientation appears to be related to levels of oxytocin (strong bonding with mates and family) and vasopressin, the only known hormones released by the posterior pituitary gland that act at a distance. Studies have reported that higher levels of oxytocin enhance an individual’s ability to read others’ emotions based on eye cues. In addition, a 2005 study in reported in Nature magazine found that people sprayed with oxytocin were more trusting in cooperation situations. Subjects whose oxytocin levels were mildly increased could infer significantly better what a target person was thinking about, based only on eye cues. The effect was more pronounced for emotions harder to read through eye cues. Persistence is the level to which a person feels the drive towards behavioral inhibition (put it off) versus behavioral activation (just do it!). High Persistence individuals are eager to initiative experiences, tend to see roadblocks as personal challenges, and intensify their efforts in response to anticipated rewards. Low Persistence individuals require the deliberate removal of barriers to action and more powerful encouragement to engage in experiences. Persistence can be considered an amplifier or modulator of the drive to ACQUIRE resources, experiences, relationships, etc… Persistence appears to be connected with the complex interaction of neurotransmitters including dopamine (motivation based on reward-prediction), and serotonin. So what does this all mean? The ability to understand and rigorously describe the Experiential Temperament of a person has a profound impact on designing products, services, interactions, etc… that fit with and influence the way people think. Designing high Novelty Seeking experiences for low Novelty Seeking customers is not ideal. Not taking into account the high Harm Avoidant temperament of some customers can lead to experiences that make people feel uncomfortable. Another client is a leading retail chain expressed a desire to “Disneyize” their experience. What they hadn’t taken into account in developing that vision is that the current customer experience could be described as: low novelty seeking; moderately high harm avoidant; and high social orientation. Some of the ideas this company had for improving the experience were brilliant. However, many of those “improvements” would have led to an unintended shift in the temperament of the overall experience; one that would have created tension for existing customers. Moving beyond these obvious points, things get much more interesting when the objective is design experiences that influence behavior towards more altruistic ends. For example, many regulated utilities are launching energy conservation and demand response programs. The objective of these programs is to shift customer behavior related to energy consumption and conservation. While there might be marginal direct benefits (e.g., reduced rates, etc…) experienced by the customer as a result of changing their behavior, there are also environmental and social benefits the customer may not easily perceive. As we’ve been engaged with clients working on this problem, it’s become clear that there’s a lot that any company can learn from this more challenging experience design problem. For example, the airlines have done a good job of influencing customer behavior regarding online check-in and the use of kiosks rather than agents, despite initial customer tentativeness and resistance. What Comes First: Attitudes or Behavior? While it seems natural to assume that customers’ beliefs and attitudes are precursors to their behavior, practical experience supported by numerous academic studies have demonstrated that the linkage is highly complex. For example, many people have attitudes and beliefs consistent with environmental conservation yet do not exhibit any significant conservative behavior. A person’s expressed beliefs and attitudes about environmental issues are not a strong indicator of how that person will act relative to those issues. In fact, you can’t even assume that a person who identifies themselves as an environmentalist will necessarily have either a solid understanding of the issues or be any more willing to modify their behavior to make it more environmentally friendly. “Individuals who hold attitudes that are strongly supportive of energy conservation were found to be no more likely to conserve energy.” Archer, D., Pettigrew, T., Constanzo, M., Iritani, B., Walker, I. & White, L. “Energy Conservation and Public Policy: The Mediation of Individual Behavior” Energy Efficiency: Perspectives on Individual Behavior, 69-92. “500 people were interviewed and asked about personal responsibility for picking up litter, 94% indicated that individuals have a responsibility for picking up litter. However, when leaving the interview, only 2% actually picked up the litter that had been “planted” by the researcher.” Bickman, L “Environmental Attitudes and Actions” Journal of Social Pscyhology, 87, 323-324. “An investigation of the differences between recyclers and non-recyclers found that they did not differ in their attitudes towards recycling.” DeYoung, R. “Exploring the Difference Between Recyclers and Non-Recyclers: The Role of Information” Journal of Environmental Systems, 18, 341-351. Lack of Knowledge. Inconsistency between a person’s expressed attitudes and their behavior might be partially attributable to a lack of understanding of what to do or a lack of understand the implications of their actions. While numerous studies show that information or education alone has little or no effect on behavior, it is still a critical enabler. Perceived Barriers. External barriers and constraints set limits on what can be accomplished by just changing a person’s attitudes. The higher the barriers, including expense, inconvenience, and technical difficulties, the less the effect attitudes will have on a person’s behavior. Perceived Benefits. A person may have to incur immediate and well-defined inconvenience, uncertainty, and monetary costs in exchange for longer term benefits experienced by the broader population rather than the individual themselves. This is related to Hardin’s metaphor of the Tragedy of the Commons. Identifying Specific Perceived Barriers and Benefits. This requires field-based observation and elicitation research (See: Observation and Elicitation: We Like to Watch!) focused on surfacing: What makes the desired behavior difficult/easy? What are the perceived positives and negatives? Who wants you to do it and who doesn’t care? This qualitative research is used to clearly identify the ways that customers experience the barriers and benefits. Designing prompts / reminders for new behaviors. Helping people remember – making it difficult for them to forget. Measuring and reporting progress against individual and community goals. Piloting and Refining Behavior Change Programs. It is very important that any programs be tested and refined in the field. This can be done with a sample or segment of customers. The purpose of this pilot is not just to evaluate the design but to improve it with observation and feedback gained from the participating customers. Efforts to encourage people to conserve energy must provide information that can help them understand what the effects of specific changes in behavior will be. For example, the information on a typical electric bill is not detailed enough. These bills typically summarize overall usages. This doesn’t give consumers any clue as to the relative effect of various resource-conserving actions. As a result, misconceptions about the impact of various actions persist despite educational efforts to change them (e.g., the impact of turning off lights vs. making less frequent use of the clothes dryer). Providing incentives can be effective. However, if incentives are significant, many people come to believe they are acting only for the incentives. They may begin to require larger incentives to do things that they might previously have done only with small incentives. In these situations, the behaviors often stop as soon as the incentives are removed. In general, people tend to sustain changes in behavior when they have chosen those behaviors without the influence of significant incentives or penalties. Attitudes about specific threats are more predictive of behavior related to those threats than general concerns about the environment are predictive of general environmentally friendly behavior. For example, attitudes towards recycling are more predictive of recycling behavior than are general concern about the environment. Stronger commitments yield more persistent behavior. A commitment accompanied by an agreement to promote target behavior among neighbors has more behavioral influence than just the expression of commitment by itself. Encouraging customers to commit to a more specific goal is more effective than more general goals to conserve energy. Aligning consequences to behavior is critical. For example, having customers pay for trash pickup based on the amount of trash they produce is more effective than impassioned pleas to reduce trash. While publishing typical customer behaviors can generate peer pressure, it is a double edged sword. It can encourage people who are already doing both better and worse than average regress to the norm. Publishing exemplary behavior is an alternative to publishing average behavior. This is a topic we’ll continue to explore as we progress in our work with utilities on the design of more influential programs and experiences.